Left-handed pitcher Kirby Snead solidified his role in 2017. 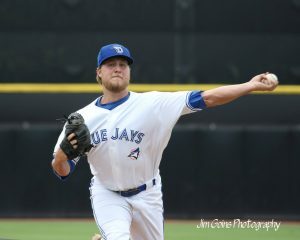 Snead, who performs primarily as a lefty specialist out of the bullpen excelled in his 55 1/3 innings pitched, between Lansing and Dunedin last season. Finishing his year with an impressive 1.21 WHIP, a 9.1 K/9 ratio, and eight saves was a vast improvement over his rookie-season in the organization. Snead credits his increased success on the mound to the adjustments he made to his mental game last season. And getting righties out is what he did last season. Striking out 15 batters, while maintaining a 1.29 ERA against right-handers was a definite improvement over 2016. One thing that was definitely good was Snead’s command of his repertoire. Currently using a mix of a fastball, slider, and changeup; he relies more on movement, instead of velocity to find success every outing. With that in mind, it’s important for Snead to consistently hit his spots for continued success moving forward, and that’s his plan for 2018. Fans will be following Kirby Snead’s development this season and for years to come.